Nokia never ceases amusing us or should we say confusing us. 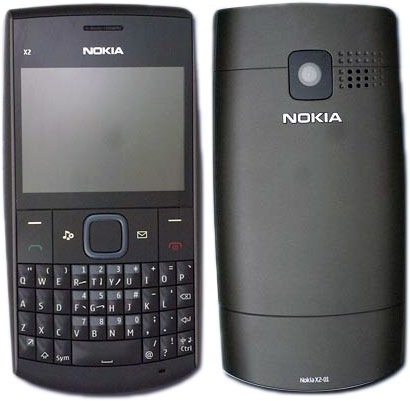 At a time when we were still struggling to get our heads around its many platforms (Symbian S40, S60 3rd edition, S60 5th edition, Symbian^1, Symbian^3, Symbian^4 and MeeGo) and its naming schemes (C6-00, C6-01…), the Nokia X2-01 takes the cake for being the most challenging product of them all. First, the name – X2-01 – does not really tell how it is different from the X2-00. Does it have a better camera? Or a slide-out QWERTY? You can only make wild guesses from the name. It is not until you see the picture that you realise it is a QWERTY keypad version of the X2-00. But wait, doesn’t it remind you about the C3? Of course, it does! But then this one belongs to the X-series so probably Nokia might offer some music related stuff with it. On the specs front, it is claimed the X2-01 has a 3.0 MP camera (the X2-00 has 5.0 MP while the C3 has a 2.0 MP camera) and like the X2-00 and the C3, the X2-01 also runs on Symbian S40 platform. It does not have Wi-Fi support and going merely by the X2-00’s specs, it is unlikely to have 3G connectivity either. The C3 has Wi-Fi. Now the big question is, how will Nokia position the X2-01. Will it be below the C3 (considering it does not have Wi-Fi) or above it (the X2-01 has a better camera)? We shall get our answer when Nokia officially announces the phone. We are crying tears of joy. A dream everyone of us had for the past couple of years is finally about to come true. A dream to fuse Sony PSP with a cellphone to get the PlayStation Phone. Yeah, rumours about such a device have existed for a long time but today, Engadget brings the first live shots of the PS Phone. The PS Phone is expected to run on the latest version of Android called Gingerbread and will sport a Qualcomm MSM8655 chipset with a 1 GHz processor. It will also have 512 MB of RAM, 1 GB of ROM and a display that would range between 3.7 and 4.1-inches. The controls are very PSP-like and the pad in the centre is said to be a touchpad with multi-touch support. It is unknown when the device will be launched, but considering that the Gingerbread Man has arrived at Googleplex, it should not take long. We can expect an announcement latest by the first quarter of next year if it is not made before the holiday shopping season itself. What is really unknown at this point is the kind of games we will get to see on this device. Well, for that we will have to wait for some more time. Till then head over to Engadget Mobile for more pics. The Windows Phone 7 launch event has not begun yet and we have the third high profile WP7 smartphone in our midst already. After the LG Optimus 7 and the Samsung Omnia 7, here’s the HTC HD7. It is basically the same as the HD2 – 4.3-inch display, 5.0 MP camera and Qualcomm’s Snapdragon 1 GHz processor. The only thing new is the 16 GB internal flash memory and of course, the new operating system. Follow us on Twitter (@cellpassion) for live updates from the launch press conference.